I won’t lie to you. Wednesday night was rough. It was a beautiful day – 60 degrees and sunny. I got home from work a little earlier than usual, so IEP and I took the dogs for a walk. We were chatting with each other, pointing out leaves, trees, and squirrels. It was a perfect spring evening… until the halfway point of our two-mile loop. It was faint at first, but with each step it became more distinct. Someone was cooking out. 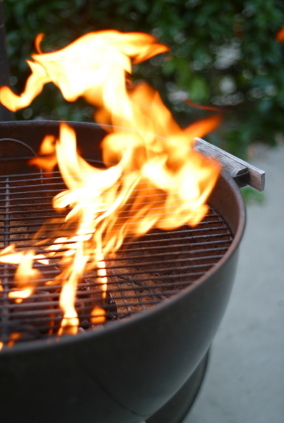 You know that smell: the first savory waft of meat on a grill after a long winter of propane and charcoal hibernation. (If you don’t know that smell, woe is you.) I usually cheer that smell. It means that winter is officially behind us. We’ve taken to our backyards with tongs in hand. Hooray!! Not so much for me, though. For me that smell was just a tease; a nanny-nanny-boo-boo to my current vegetarian imperative. Rather than slowing my pace to bask in the scent of sizzling hamburgers I hastened to move into neutral air space as quickly as possible. Instead of being excited I was sad; sad that I couldn’t participate in one of my favorite springtime rites of passage. This whole little episode, while brief and anecdotal, was a strong reminder to me of why so many of us have willingly turned a blind eye to the dark side of our food supply. Meat tastes good. Not only does it make us full gastronomically, but it makes us whole culturally. Consider the extent to which meals are the lynchpin of our biggest cultural moments. And consider the extent to which meat is the centerpiece of those meals. The Thanksgiving turkey. The Christmas ham or rib roast. The ballpark hot dog. The backyard barbecue. Without meat these events would hinge on stuffing, Brussels sprouts, peanuts, and potato salad, respectively. And while I love each of those things, they hardly get me excited enough to loosen my belt a notch to make extra room. This, for me, is the biggest conundrum of my vegetarian experiment. I want to be an informed consumer whose actions reflect her understanding and beliefs. But I do not want to sever myself from the culinary components of my culture which make me feel a part of something significant and enduring. Sweet relief! I don’t have to be perfect! I can pop into a McDonald’s on a road trip without dismantling my entire values system. I can go to a cookout at a friend’s house without nitpicking over the source of the meat they’re grilling. I can live a normal life and still uphold my beliefs to a reasonable level. Pardon me a moment while I exhale. … Whew. Okay. I’m back now. As for my reading assignments, I have finished (mostly) The Omnivore’s Dilemma. (Full disclosure: I skimmed the second half of the third section. To take his intellectual premise to its logical extreme, Pollan spends the third section of the book actually hunting wild boar and foraging for mushrooms. Since these are activities that will never factor into my own food chain I didn’t devote the same time and consideration to them that I did the sections on industrial and organic farming.) And it was completely fascinating. Perhaps my fascination stems in part from the fact that my level of interest in this topic includes me in a self-selected pool of people who are inclined find this book fascinating. Nevertheless, I really enjoyed it. It reads like the transcripted version of a lecture by a really interesting college professor. He takes agricultural theory and brings it to life. Topics like corn subsidies, grass species, and the dimensions of organic baby lettuce beds could be mindbogglingly dry. But Pollan doesn’t just provide the facts. He tells the story, and it lures you in. He writes with a slant, to be sure; I was never confused about his position. But when you consider that the slant I’ve been subconsciously provided by the food industry for 32 years tells a very different story, I don’t think a bit of impassioned positioning from Pollan discredits him that much. I am more than halfway through the month of March now. I am craving a hamburger. My creative culinary juices are running thin and I’m missing my normal kitchen routines. But I have another book to read and nearly two more meatless weeks in front of me. I don’t presume that I’ve learned all I can on the topic of our food supply and its reverberations throughout our society. So for the next 12 days I will continue to forge ahead. Perhaps I will find myself energized by Mr. Foer. I’m about 50 pages in and, again, riveted. Perhaps I will sate myself with mental meat, rather than the hamburger I’d rather devour. This entry was posted on Friday, March 19th, 2010 at 5:00 am	and is filed under Change, Choices, Culinary, Reading, Vegetarian Experiment. You can follow any responses to this entry through the RSS 2.0 feed. Both comments and pings are currently closed. I’ve been vegetarian for over four months now. And I completely understand those carnivorous cravings. I was weakening then I decided to watch the movie Earthlings. Talk about a motivational booster! That movie isn’t for everyone, but if you care about what is done in your name to provide you with meat, it is certainly worth a look. I also recommend the book Fast Food Nation. That will help with understanding the food supply and maybe even provide a little encouragement in the McDonalds area as well. I just found your blog and look forward to reading about your efforts. Good luck! Gale – I too am relieved that I can take a small-scope approach to the big-ag problem and still be doing (a little) something to help. So it is worth watching my food source, even if I only commit to one meal a week. Great to know! I think this is an important idea. Yes, you are going veg-head for a month, but if you make informed choices about where your food comes from, meat definitely has a place on the table. My husband, for years, has railed about the hormones in chicken. He insists it causes premature development and obesity in kids. I have laughed at him until my face turned blue. Total bunk, I said. My 2nd grader is growing breast buds. No lie. Genetics or chicken? I don’t know. But damned if I’m NEVER buying anything but organic meat from now on. Gale – I would have grilled. I grill veggie burgers right along with hamburgers. I also try to buy local meat when I do buy it. Sometimes I think that is more the answer to big ag issues than anything else – eating local or as local as you can. Thanks for sharing the Michael Pollan quote about every meal as a new vote. Even though I’m a vegetarian, I know that I am far from blameless when it comes to responsible eating – both from an environmental standpoint and from a personal health standpoint. But it’s nice to know that one bag of Ruffles isn’t going to erase every other good choice I will make down the road. I have been a life long vegetarian and have never tasted any type of meat. I’ve had friends and family members try to go without meat for weeks, months, and years. Each one has said it is so difficult. I applaud your efforts and good luck. I am glad I discovered you through Aidan and ILI. Hi Gale, I clicked over from Nicki’s Nook. I love how thoughtfully aware and also questioning this post is. I’m almost done reading Eating Animals which has reinforced my resolve to choose vegetables when possible.